Suri is the Director, Partnerships, India, Next Billion Users and is passionate about bringing the next billion users online. Prior to this, Suri has held a diverse work portfolio, including leading People Operations for the Sales and Operations teams at Google, India. Before that, he led the Small and Medium Business (SMB) segment focused on helping SMBs get their businesses online, set vision and strategy for how their advertising can reach thousands of users and drive maximum impact out of the web. 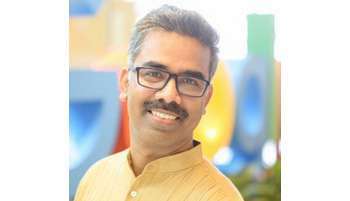 He also lead Google’s AdSense efforts for India which helped Indian websites monetize their content. Before joining Google, Suri worked extensively in the B2B space where he led sales, products and marketing efforts in Bharti Airtel Ltd, Anatraix E Applications Limited and Blow Plast Ltd.
On a personal note, he is an Indian Institute of Management, Lucknow alumni. He is settled in Hyderabad with his wife Sanju, and has two kids Sisir and Sahasra Sri. He is a movie buff and an avid reader!